IntelliQuad senses smoke particulates, carbon monoxide (CO), heat, and infrared signatures simultaneously to determine the presence of a fire condition. The IntelliQuad detector is the latest innovation in intelligent sensing from NOTIFIER. IntelliQuad is an intelligent, multi-criteria detector capable of sensing the four major signatures of a fire: smoke, heat, infrared light, and carbon monoxide (CO). 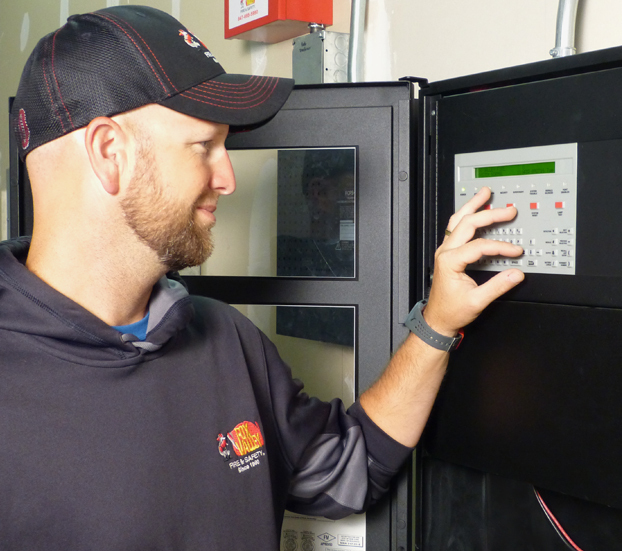 IntelliQuad’s sophisticated on-board algorithms continuously evaluate readings from its four built-in sensors and more accurately respond to actual fires while increasing immunity to false alarms. The IntelliQuad multi-criteria detector has six programmable levels of sensitivity. Sensitivity levels are selected by the system designer based on expected conditions where IntelliQuad is installed. From clean rooms to industrial installations, the six sensitivity levels meet any need for early, accurate detection with confirmation of a true fire condition before alarming. 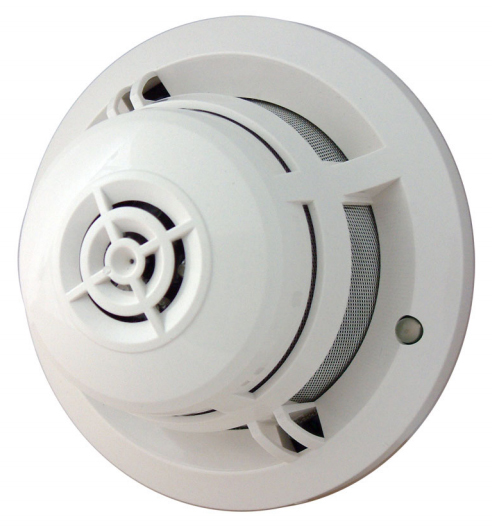 Photoelectric Detector: Photoelectric chamber senses airborne particulates for smoke detection. 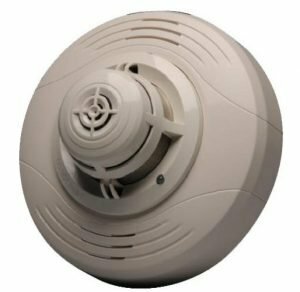 Carbon Monoxide Detector (CO): Proven electro-chemical cell technology monitors carbon monoxide gas produced by incomplete combustion. 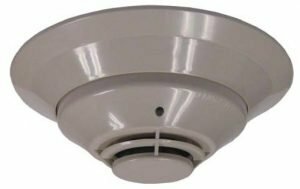 Infrared Detector: Measures ambient light levels across 360° as a background value and compares the background levels to the presence of light generated by a burning fire. Thermal Detector: Heat sensor technology with a software compensated, linear temperature response to monitor rate–of-rise or a fixed temperature (135°F) threshold. If the photoelectric sensor detects airborne particulates as smoke, the on-board microprocessor will verify the fire condition by looking for a second signature from one of the other three sensors; the infrared, thermal, or carbon monoxide detector. As soon as the second fire signature is confirmed by IntelliQuad’s internal algorithms, the detector will send an alarm signal to the fire alarm control panel. Testing has shown that IntelliQuad detects fire more rapidly than single element detectors with far fewer nuisance alarms. The IntelliQuad is sensitive to fires in all environments. 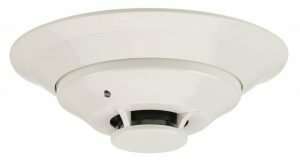 Its high level of accuracy and precision make it perfect for facilities where the disruption of nuisance alarms cannot be tolerated—facilities where occupant evacuation carries a significant health, security, or financial consequence. B710LP: Flanged mounting base. 6.1” (15.5 cm) diameter. B710LPA: Flanged mounting base, ULC Listed. B200S: Intelligent sounder base, capable of producing a variety of tone patterns including ANSI Temporal 3. Compatible with System Sensor sychronization protocol. B200SA: Intelligent sounder base, capable of producing a variety of tone patterns including ANSI Temporal 3. Compatible with System Sensor sychronization protocol, ULClisted. B200SR: Intelligent sounder base, Temporal 3 or Continuous tone. B200SRA: Intelligent sounder base, Temporal 3 or Continuous tone, ULC-listed. B224RB: Relay base Screw terminals: up to 14 AWG (2.0 mm²). Relay type: Form-C. Rating: 2.0 A @ 30 VDC resistive; 0.3 A @ 110 VDC inductive; 1.0 A @ 30 VDC inductive. Dimensions: 6.2″ (15.748 cm) x 1.2″ (3.048 cm)..
B224RBA: Relay base, ULC Listed. B224BI: Isolator base. Dimensions: 6.2″ (15.748 cm) x 1.2″ (3.048 cm). Maximum: 25 devices between isolator bases. B224BIA: Isolator base, ULC Listed.